Ryan Coogler's groundbreaking superhero pic Black Panther continued to defy all expectations in its sophomore outing, grossing an estimated $108 million from 4,040 theaters to score the top second weekend of all time behind Star Wars: Force Awakens. The Disney and Marvel title raced past the $400 million mark in the U.S. in just 10 days after dropping a narrow 47 percent from its opening weekend. That's one of the lowest declines ever for a superhero title, as well as one of the lowest for a film launching north of $200 million (the bigger the opening, the bigger the drop in many instances). Overseas, it earned $83.8 million for an international tally of $304 million and global haul of $704 million. In North America, Black Panther earned more in its second outing than any number of 2017 tentpoles did in their first weekend, including Wonder Woman ($103.3 million), Justice League ($93 million) and The Fast and the Furious ($98.8 million). And it ties with Jurassic World in reaching $400 million faster than any film in history behind Force Awakens. Force Awakens also is the champ in terms of biggest second weekend domestically with $149.2 million, not accounting for inflation. Black Panther passed up the likes of Jurassic World ($106.6 million) and fellow MCU title The Avengers ($103.1 million). The movie continued to play to an ethnically diverse audience. 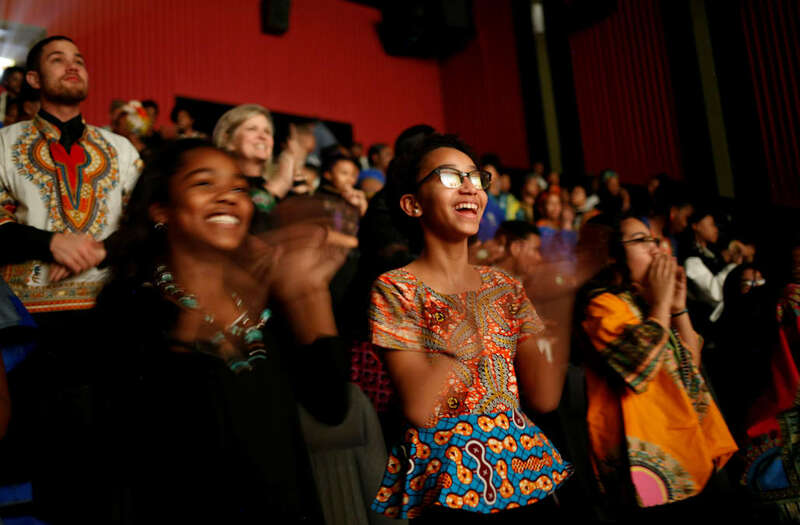 Caucasians made up a bigger share of ticket buyers this time out, or 37 percent, compared to 35 percent on opening weekend, while the African-American share went from 37 percent to 33 percent according to comScore/Screen Engine. Hispanics remain unchanged at 18 percent, followed by Asians (7 percent) and Native Americans/Other (5 percent). No other marquee superhero tentpole has played to such a diverse audience. In the film, Chadwick Boseman stars as T'Challa/Black Panther alongside Lupita Nyong'o, Michael B. Jordan, Daniel Kaluuya, Letitia Wright, Danai Gurira, Winston Duke, Angela Bassett, Forest Whitaker and Andy Serkis. The story, described as a tale of black power and black pride in addition to its superhero themes, follows T'Challa as he is sworn in as king of Wakanda, a cloaked, technologically advanced nation in Africa that is home to the exotic metal vibranium, the source of Black Panther's powers. Among a trio of new films, New Line's R-rated comedy Game Night, starring Jason Bateman and Rachel McAdams, fared the best. The movie, facing a strained marketplace for comedies, opened to a solid $16.6 million from 3,488 locations. Directed by John Francis Daley and Jonathan Goldstein, the story follows a couple whose regular game night with friends suddenly turns into a real-life murder mystery. The cast also includes Kyle Chandler, Billy Magnussen, Sharon Horgan, Lamorne Morris and Kylie Bunbury. Alex Garland's sci-fi pic Annihilation, starring Natalie Portman opposite Oscar Isaac, opened to a muted $11 million from 2,012 theaters for a projected $10 million domestic launch. The movie, earning a poor C CinemaScore, made headlines late last year when Paramount and Skydance, partners on the movie, sold off international rights to Netflix. Annihilation -- directed by Alex Garland of the acclaimed Ex Machina -- tells the tale of a biologist and former soldier, who joins a mission to find out what happened to her husband inside "Area X" along America's coastline, where a sinister phenomenon has turned the landscape into an environmental wasteland where mysterious dangers abound. Jennifer Jason Leigh, Tessa Thompson, Gina Rodriguez and Tuva Novotny co-star. YA film adaptation Every Day, directed by Michael Sucsy, placed No. 9 with $3.1 million from 1,625 cinemas. Orion insiders say that's a win, considering the film cost under $5 million to produce. Every Day, targeting teenage girls and younger adult females, is based on the best-selling book by David Levithan about a 16-year-old girl who falls in love with a disembodied spirit who inhabits a different body every day. Angourie Rice, Justice Smith, Debby Ryan and Maria Bello star.